The works of physician and nurses are outstanding. Being able to cure a disease and relieve pain is worth recognizing. Attending one’s health is indeed a crucial job and requires more than the physical strength. It also requires the mind, the attitude, the values, the heart, and the soul. Getting the right diagnosis is always the key to treatment. Having the right diagnosis will help thousands of patients and will save time, effort, and money. Getting a diagnosis right requires proper knowledge, skill, expertise, and equipment. Having a good stethoscope to attend auscultation is just a step to a longer journey. 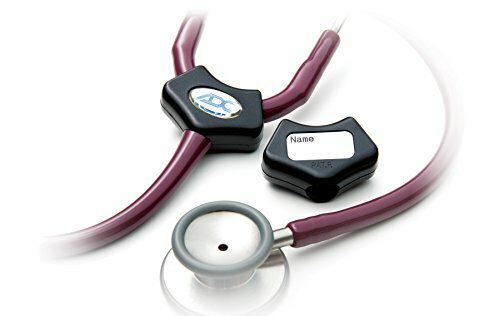 In this article, you will be able to understand what ADC Platinum Adscope 615 Stethoscope is, what it is made of, and its features. This is a completely honest review – considering the pros and cons of the said product. Furthermore, expect first hand experiences and claims made by customers who bought this product. This article may serve as a good guide for you in deciding on purchasing the perfect stethoscope for you. ADC platinum Adscope 615 Stethoscope is one of the finest stethoscopes available in the market. It is designed with an oversized chestpiece and AFD technology. With ADC Platinum Adscope 615 stethoscope, you will be able to hear higher frequencies by just adjusting the pressure with non-chill rims that caters ultimate patient comfort. ADC Platinum Adscope 615 Stethoscope features a single head, infusion of AFD technology that provides acoustic response of a traditional bell and diaphragm, a light pressure for low bell-type frequency and a firm pressure for high diaphragm frequency, a zing alloy chestpiece with stainless steel finish, a sculpted chestpiece, a non-chill diaphragm retaining ring for patient comfort, a cardiology headset with large bore stainless steel binaurals fixed at 15 degrees angle, reinforced with yoke molded into 22 inch flexible PVC tubing, an Adsoft Plus silicon eartips wit snap on connection and 2 spare pairs of Adsoft Plus ear tips and ID tag. It claimed to have an outstanding performance, durable and has an ergonomic design. It is completely 100% latex free. The dimensions of this stethoscope follow the total length of 30.5 inches and weight of 5.4 ounces. The ADC Platinum Adscope 615 stethoscope is assembled, inspected, and packaged in the United States of America. Upon purchase, one will be given a lifetime warranty. Like any product, there is always that side that people tend to appreciate upon usage. The following will be customers’ reviews upon experiencing the ADC Platinum Adscope 615 stethoscope. ADC Platinum Adscope 615 stethoscope is quite a good buy. It has a fair price of $39.98 in Amazon. The price is right for the quality and performance of the stethoscope, per se. You may take time to read on what people say about their experience upon using the stethoscope. Mnhtarheel (2011) made a purchase of this stethoscope on the year 2011. 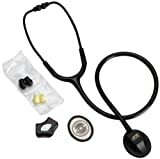 He happened to purchase this stethoscope upon comparing reviews on different stethoscopes in Amazon. He owns several stethoscopes and upon using this stethoscope, he was pleased with the clarity, quality, and volume of the heart sounds it delivers. He was even happy about its aesthetics. Amanda (2012) is a very satisfied user of the ADC Platinum Adscope 615 stethoscope. She happened to purchase really expensive stethoscopes available due to the belief that expensive ones will have better quality, but this stethoscope did not fail her with her expectations. She claimed that the ADC Platinum Adscope 615 stethoscope allows her to hear all the subtle heart and lung sounds. Carlos Murillo (2010) was so happy upon ADC Platinum Adscope 615 stethoscope purchase. He decided to avail one upon the loss of his Littman’s. He claimed that this stethoscope worth more than its price. It performs well as Littman’s. Rodney Martens (2012) think of this stethoscope as great deal for its price. He claimed that the ADC Platinum Adscope 615 stethoscope is perfect for everyday nursing – it had delivered him good quality heart sounds, lung sounds, and bowel sounds. YomicaBamundo (2013) was tired of buying expensive stethoscope and had decided to purchase an ADC Platinum Adscope 615 stethoscope. She claimed that the price was just right, and that this stethoscope delivers amazing clear sounds. She was also happy of having this stethoscope due to its light weight. Not all physicians who came to purchase this scope were happy with the quality they had experienced. On this section, you will be able to read about the negative insights about this stethoscope. ZeMerg (2014) an ER Doctor who purchased this stethoscope was not completely satisfied upon use. He had made a complete comparison between the ADC Platinum Adscope 615 stethoscope and Littman’s Cardiology III. ZeMerg claimed that ADC platinum Adscope 615 stethoscope’s earpiece is cheap, flimsy and of poor quality compared to Cardiology III. He also claimed that the sound quality is not as good as he expected it to be. He stated that hearing heart murmurs and lung sounds was impossible with the use of this product. He claimed that the volume is low and the acoustics are not that great. John Philip (2014) claimed that the ADC platinum Adscope 615 stethoscopes’ finish is not good. He stated that the black coating can easily be chipped off and looks unprofessional. Also, he had experienced trouble with the ear pieces, as it popped out while he was working. James A. Christian (2012) was first satisfied with his experience of this stethoscope. However, upon using it for a year, he claimed that the whole of this stethoscope had completely fallen to pieces. The soft rubber ear pieces fall off first, then the rubber retaining band come loose. The ADC Platinum Adscope 615 stethoscope is worth its price. The quality of sound it delivers is fair enough, considering that it has a cheap price. This stethoscope is lightweight and can be used for everyday auscultations. However, the durability may not be as good as you expect it to be. The stethoscope may only be used for a short period of time. Indeed, ADC Platinum Adscope 615 stethoscope is worth buying, but it may not last for long.